Big name businesses including Tesco, Ikea and Chelsea Football Club have signed up to a scheme to cut London's carbon emissions. The Mayor of London's Green500 scheme offers support and awards to encourage businesses to be more carbon efficient. Businesses and public sector employers produce a third of London's carbon emissions, the capital's mayor Ken Livingstone said. He wants to use the scheme to help cut that figure by 60% by 2025. Mr Livingstone said: "The London green organisations programme will motivate, support and reward organisations to reduce their carbon footprint. "This is a world first, and places London at the forefront of government and business working together to cut carbon emissions." He wants large businesses to cut carbon emissions by three million tonnes by 2010, which he said would save them £300m in energy bills. Companies signing up to the Green500 scheme will receive a carbon assessment, assistance in developing an emissions reduction plan and they will commit to publish their progress annually. There will be yearly awards to recognise those firms which reach their target and for top achievers. Manny Lewis, chief executive of the London Development Agency, said the scheme was "not only a pioneering means to help businesses be energy efficient and to reduce London's carbon footprint, but will also help to maintain London's global status as an economy". 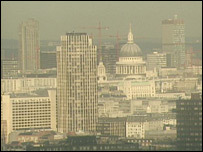 In a separate scheme commercial landlords in the capital also committed to cut carbon emissions from their properties. Land Securities and Transport for London were among the commercial landlords to sign up for the Better Buildings Partnership scheme, developed by the London Climate Change Agency. Members will set benchmark carbon levels for their properties and remove barriers preventing the widespread take-up of sustainable building improvements - such as the fact that rental values rarely take into account a building's energy efficiency. Last week the mayor announced a programme to help residents reduce carbon emissions in their homes.